As a .NET developer, you might assume that Azure is the best place for your applications. But how does Everleap compare? Our test results indicate that Everleap outperformed Azure in both speed of response and in ability to maintain a high traffic load, two of the primary measurements most people are looking for when they move from traditional hosting to one of the big cloud providers. In this test, we recorded the average response time with a sustained load of 50 users on identical installations of a nopCommerce v3.5 demo store site. The Everleap installation used our Single site plan and MS SQL database and the Microsoft Azure installation used Azure SQL Database on the Azure B2 Basic plan (see methodology section below for more details). As you can see, the average response time on Everleap running a single server is 2.52 seconds, and with Azure running 1 instance, it is 4.32 seconds. When we increased the number of servers at Everleap the response time became even better, down to 0.53 seconds when running on 3 servers. 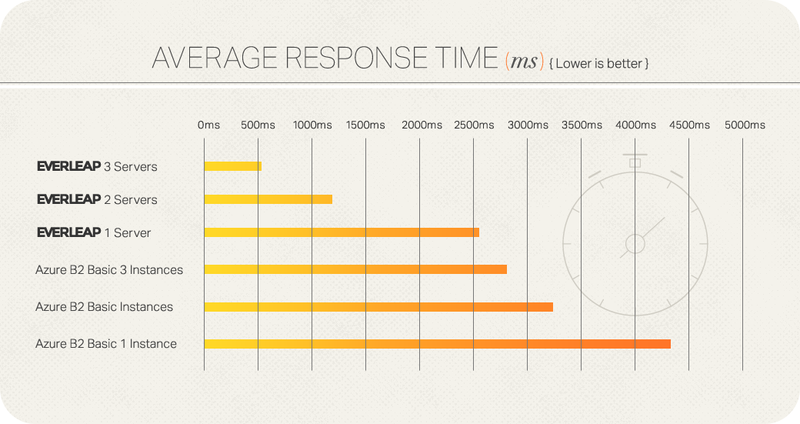 When we increased the number of instances on Azure, the response time also improved. But even when comparing 3 instances on Azure to 1 server on Everleap, Everleap is still slightly faster. It's worth noting that both SQL and a second server are included at no additional cost in the base plan at Everleap, but at Azure each additional instance as well as Azure SQL Database are add-ons, so each comes at additional cost. In this test we steadily increased the number of users and observed when the site experienced the first error. "Error" is defined as either a server error (e.g., 500 error) or a response time of 20 seconds or more. For this test we included the Azure B1 Basic (small) plan as well as Azure B2 Basic (medium). The duration of the test was one minute. With each of the three plans running on 1 server or instance, Everleap sustained 175 clients before an error. Azure B2 Basic made it to 65 and Azure B1 Basic topped out at 40 clients before failing. 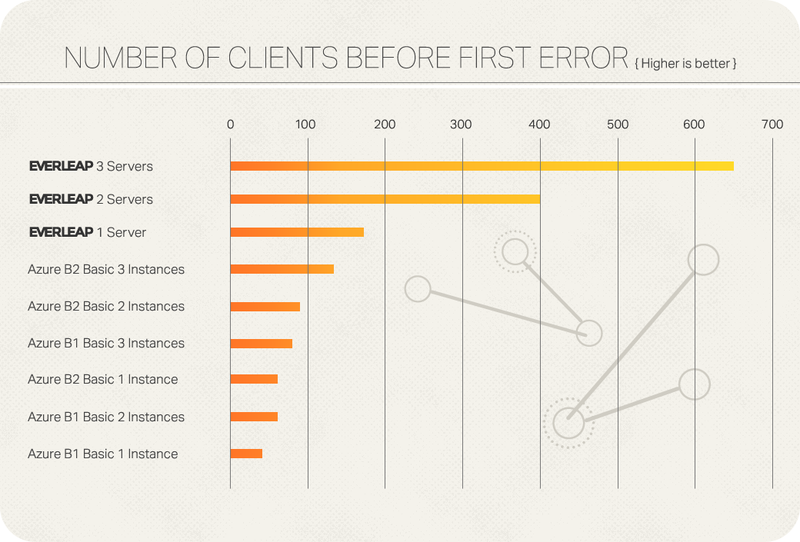 Increasing the number of servers or instances increased the number of clients before error, as you would expect. But again, Everleap running on a single server outperformed every one of the Azure configurations we tested, all the way up to Azure B2 Basic running on 3 instances. Everleap running on 3 servers accommodated 5 times the traffic that Azure B2 Basic running on 3 instances could accommodate. Everleap runs on Windows Azure Pack, which is essentially the same bits running at Azure. So why the difference? We can only speculate since we don't have any inside knowledge about the hardware or network architecture inside Azure. We do know that we've been hosting .NET websites since .NET was born, and we've always been on the cutting edge of the technology. Over the years we've become very good at what we do, and we like to think that experience and expertise shows in everything we do. Which brings us to one last point, and that is if you ever run in to a problem or need technical support at Azure be prepared to get out your credit card (again). We're here for you with our years of expertise and knowledge any time you need help. We're an agile, expert team that you can get to know by name. Everleap is big cloud hosting on a human scale. To be clear, the point of these tests wasn't to say that there aren't any good use cases for Azure, that's certainly not the case. If you run an application with a million users you're going to want the resources of a huge network like Azure behind it. But most sites and applications don't have such extreme needs. What they do need is high quality, modern, flexible, reliable service. That's what Everleap is here for. We invite you to read some of our customer stories to see how developers with a wide variety of needs are making use of Everleap. For the tests we used identical installations of a nopCommerce v3.5 demo store site. Databases were SQL Web Edition at Everleap, and Azure SQL Database at Azure. We used SQL 2012 for all test installations. Individual plan details are provided below.